Noordwijk, December 15 2014 when tons of starfishes and ensis beached after storm. 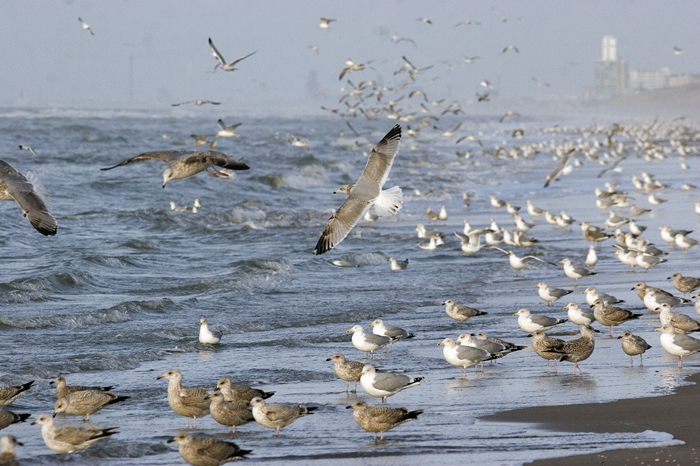 15.000+ gulls present. The differences between typical western argenteus from the U.K. and northern Scandinavian argentatus is rather straightforward on primary pattern P5-P10. However, there is a gradient and overlap in features of birds from populations in northern Germany, Denmark and southern Norway. Extensive research on the P10 pattern of Scandinavian argentatus was done for Norwegian birds by the Norwegian ornithologist Edvard Barth, and is presented in the table in the Adult January Section. Adult argenteus from the Netherlands and Belgium have finished the complete moult, bur argentatus from Scandinavia may still show active moult in the outer primaries. The table below present the primary moult stage during December. Primary Moult Score of adult Herring Gull (argenteus & argentatus) at Scheveningen, the Netherlands in December, ranked by date. n (tot): Total of individuals by date. 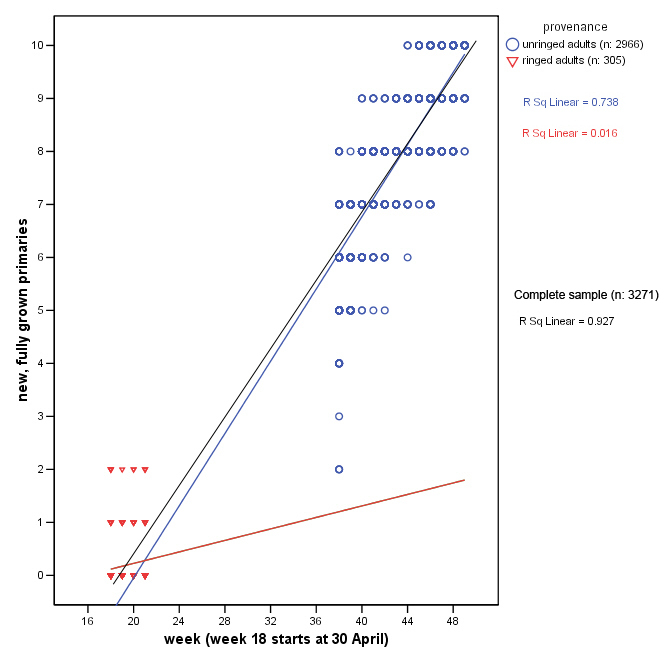 Total this month, n: 156.
m (av): Average primary moult score by date. 95% CID: 95% Confidence Interval of the Difference. Note 1: by December, adults are selected by the plain grey greater primary coverts, large tips on the new primaries and the lack of immature features (thus limited black on the bill and no obvious pigmentation in the iris). 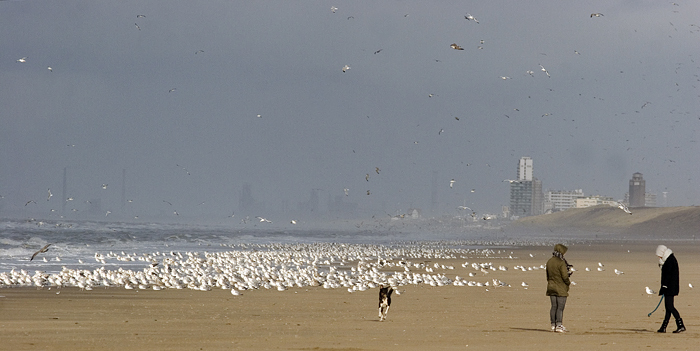 Note 2: in the summer period, the population Herring Gulls in the harbour of Scheveningen consist of local argenteus. 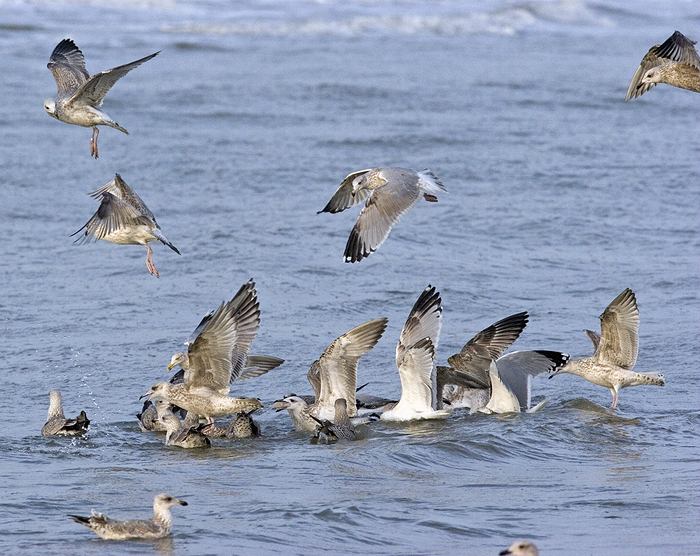 From October onwards, figures are strongly influenced by increasing numbers of Scandinavian argentatus. Herring Gull (argenteus) UA9.T March 2010 & May - December 2015, IJmuiden, the Netherlands. Ringed in winter, no provenance. Herring Gull argentatus YZ5.T adult, December 15 2015, Boulogne-sur-Mer, France. Picture: Jean-Michel Sauvage. Ringed in winter, no provenance. Herring Gull (argenteus) CLAW 5CY (5th cycle), December 19 2012, Koksijde, Belgium. Picture: Peter Adriaens. Herring Gull (argenteus) FFAC adult, December 19 2012, Koksijde, Belgium. Picture: Peter Adriaens. Herring Gull (argenteus) FJAL 6CY (6th cycle), December 17-26 2011, Koksijde, Belgium. Picture: Peter Adriaens. Herring Gull (argenteus) KSAJ adult, April 2010, March 2011 & December 2012, Koksijde, Belgium. Picture: Peter Adriaens. Herring Gull (argenteus) KSAV 10CY-11CY, April 2010 - December 2011, Koksijde, Belgium. Picture: Peter Adriaens. 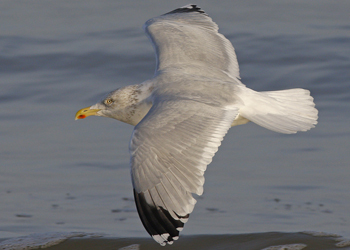 Herring Gull argenteus BLB L-901880 adult, December 23 2015, Stella-Plage, Pas-de-Calais, France. Picture: Jean-Michel Sauvage. Herring Gull (argenteus) 14+CY BLB H-122097 December 26 2012, Boulogne-sur-Mer, NW France. Picture: Jean-Michel Sauvage. Herring Gull H128286 10cy (argenteus), December 03 2011, Leiden, Netherlands. Herring Gull H132951 adult (argenteus), December 13 2012, Boulogne/Mer, France. Picture: J-M Sauvage. 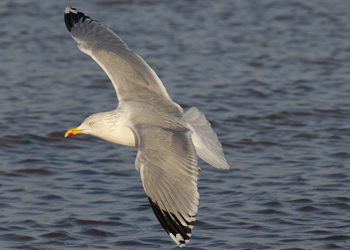 Herring Gull BLB H-901880 adult, December 23 2015, Cucq - Pas de Calais, NW France. Picture: Jean-Michel Sauvage. 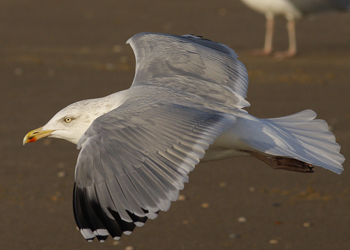 Herring Gull argenteus YADD 7CY, December 2014, Noordwijk strand, the Netherlands. Picture: Merijn Loeve. 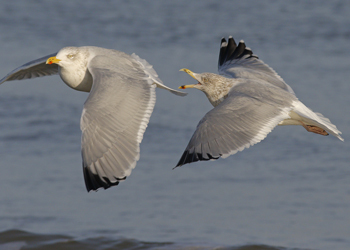 Herring Gull (argenteus) YAFM adult, 2010-2011 & 2015, IJmuiden, the Netherlands. Herring Gull Y.AKS adult argenteus), 2009 - 2010, IJmuiden, the Netherlands. Herring Gull Y.ASD adult (argenteus), December 09 2010, IJmuiden, the Netherlands. 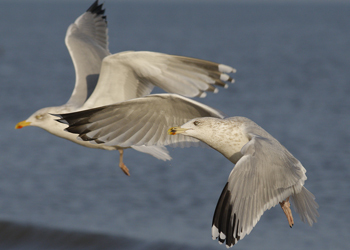 Herring Gull (argenteus) YBBN adult, December 2015 & April 2016, Zandvoort & IJmuiden, the Netherlands. Picture: Hein Verkade & Maarten van Kleinwee. Herring Gull (argenteus) MALW adult, December 17 2011, Oostduinkerke, Belgium. Picture: Peter Adriaens. Herring Gull F.AAN adult (argenteus), December 07 2010, Katwijk, the Netherlands. 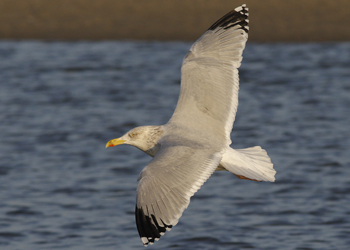 Herring Gull (argenteus) FASD adult, December 10 2015 - February 02 2016, Noordwijkerhout-Katwijk, the Netherlands. Herring Gull argenteus E816 adult, December 2014, Noordwijk, the Netherlands. Picture: Merijn Loeve. Herring Gull (argenteus) MP adult, December 10 2011, Koksijde, Belgium. Picture: Peter Adriaens. Herring Gull (argenteus) adult ZD December 02 2013, Katwijk aan Zee, the Netherlands. 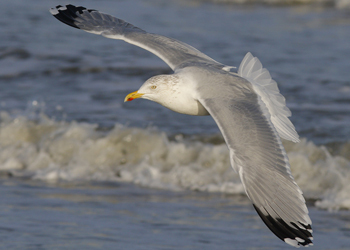 Herring Gull (argenteus) 9N adult, October - December 2015, Scheveningen, the Netherlands. Herring Gull (argenteus) A.M adult, May 2015 & December 2016, Katwijk, the Netherlands. Picture: Merijn Loeve & Mars Muusse. Herring Gull (argenteus) ZN adult, December 17 2015, Scheveningen, the Netherlands. 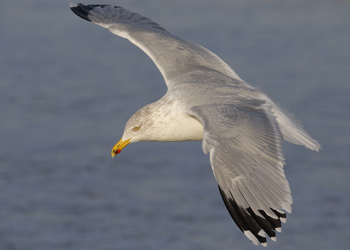 Herring Gull (argenteus) ZS adult, October 2015 - March 2016, Scheveningen, the Netherlands. 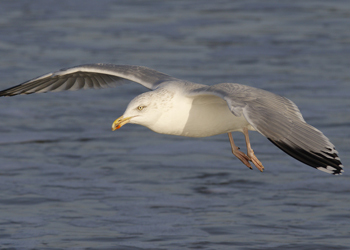 Herring Gull (argenteus) ?? adult, December 17 2015, Scheveningen, the Netherlands. Herring Gull NLA.5.277.807 21cy (argenteus), December 03 2012, Boulogne/Mer, France. Picture: J-M Sauvage. Herring Gull NLA.5.352.764 adult (argenteus), December 23 2010, IJmuiden, the Netherlands. Herring Gull 5.414.557 6cy (argenteus), December 18 2010, Leiden, Netherlands. Herring Gull NLA.5.420.527 adult (argenteus), December 31 2008, IJmuiden, the Netherlands. Herring Gull NLA.5.424.838 adult (argenteus), December 23 2010, IJmuiden, the Netherlands. Herring Gull argenteus NLA 5.463.463 adult, December 23 2016, Katwijk, the Netherlands. Herring Gull argentatus DEW 3402410 adult, December 19 2016, Katwijk, the Netherlands. Herring Gull (argentatus) J2878 6CY, December 14 2014, Hovindam - Oslo, Norway. Picture: John Sandøy. 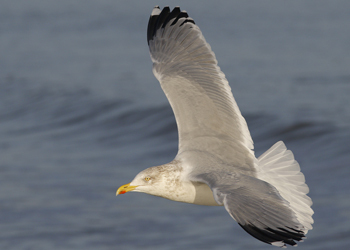 Herring Gull (argentatus) J7599 adult, December 19 2014, Hovindam - Oslo, Norway. Picture: John Sandøy. Herring Gull argentatus JX778 adult, December 17 2015, Boulogne-sur-Mer, France. Picture: Jean-Michel Sauvage. Herring Gull (argentatus) NOS 4230536 6CY, December 12 2014, Hovindam - Oslo, Norway. Picture: John Sandøy. Herring Gull SFH HT-082.209 25cy (argentatus), November 2003 & December 2008, Westkapelle, the Netherlands (51.33N - 03.25E). Picture Pim Wolf. Herring Gull (argentatus) SFH HT-259.836 adult, December 19 2016, Katwijk, the Netherlands. 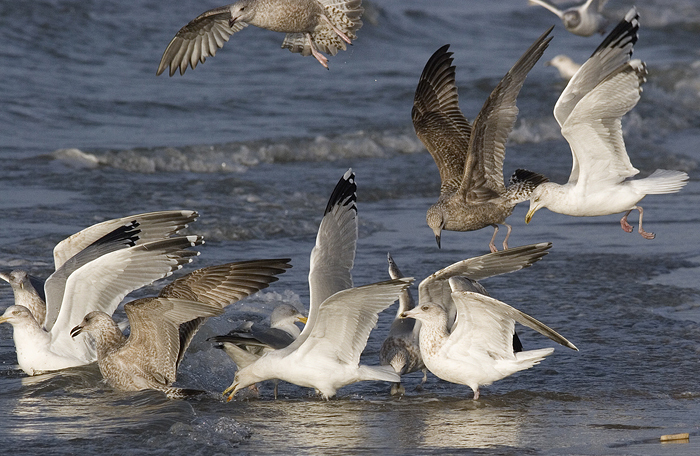 Herring Gull (argentatus) KV17 11CY (11th cycle), December 28 2015, Zandvoort beach, the Netherlands. Picture: Hein Verkade. Herring Gull argentatus adult, December 21 2014, Zabieliškis - Kaunas, Lithuania. Picture: Boris Belchev. Herring Gull adult, December 19 2016, Katwijk, the Netherlands. Herring Gull argentatus adult, December 19 2016, Katwijk, the Netherlands. Red on upper mandible and yellow legs. Herring Gull adult, December 04 2015, Scheveningen, the Netherlands. Herring Gull argentatus adult, December 04 2015, Scheveningen, the Netherlands. Herring Gull adult, December 16 2016, Katwijk, the Netherlands. Herring Gull adult, December 16 2016, Katwijk, the Netherlands. Dark iris in full adult bird. Herring Gull adult, December 02 2012, Katwijk, the Netherlands. Herring Gull adult (argentatus), December 02 2012, Katwijk, the Netherlands. Herring Gull adult (argentatus), December 19 2011, Noordwijk, the Netherlands. Herring Gull adult, December 03 2013, Katwijk, the Netherlands. Herring Gull adult, December 17 2015, Katwijk, the Netherlands. Herring Gull adult, December 15 2014, Noordwijk, the Netherlands. Herring Gull argentatus adult, December 06 2013, Noordwijk, the Netherlands. Thayeri on P9-P10, no black on P5. Herring Gull adult (argentatus), December 02 2012, Katwijk, the Netherlands. Thayeri on P9. Herring Gull adult (argentatus), December 08 2009, Scheveningen, the Netherlands. Herring Gull adult (argenteus), December 17 2015, Scheveningen, the Netherlands. With argentatus. Herring Gull (argentatus) adult, December 17 2015, Scheveningen, the Netherlands.